So soon. The routine. Did that other thing really happen? Did I really do that? Go around the world. Was it a long time ago? No? A few days ago you say…I’m already forgetting. I did. Go around the world. It was—in today’s vernacular—awesome. Actually it was just plain awesome. But when I started to catch up on diary entries for those days and weeks away they had already slipped into past tense, already a little faraway, faded at the edges, foggy in the middle. There’s always a caveat to any ‘bragging’ statement such as ‘I just went around the world’ isn’t there? For example, if I had gone around the world exactly on the equator it would have been 24,901 instead of 18,287 miles so my northern track reduced the mileage by about 7,000 miles. And sad to say more of the miles traveled were on Delta than on the world’s more humane and interesting conveyances—11,569 in fact, with a mere 6,718 on my beautiful trains and ferries. There’s a further caveat; I did the mileage by googling distance by land from place to place which is probably pretty accurate for the land-based travel, not so much for air. So Yes I Did Go Around The World but it wasn’t on the fattest route and the odometer is unreliable. I can’t stop writing without saying a little more about crossing the world this way. Wish I could travel every one of the main latitude and longitude lines. Every One. Grand geographic tours, up and down, round and round. Had I been filthy rich and started when I was seven I could have done exactly that. Now once or twice will have to do. In my next life I will be a geographer. Geography (from Greek γεωγραφία, geographia, lit. “earth description”) is a field study of the lands, the features, the inhabitants, and the phenomena of Earth. A literal translation would be “to describe or picture or write about the earth”. Says Wikipedia. 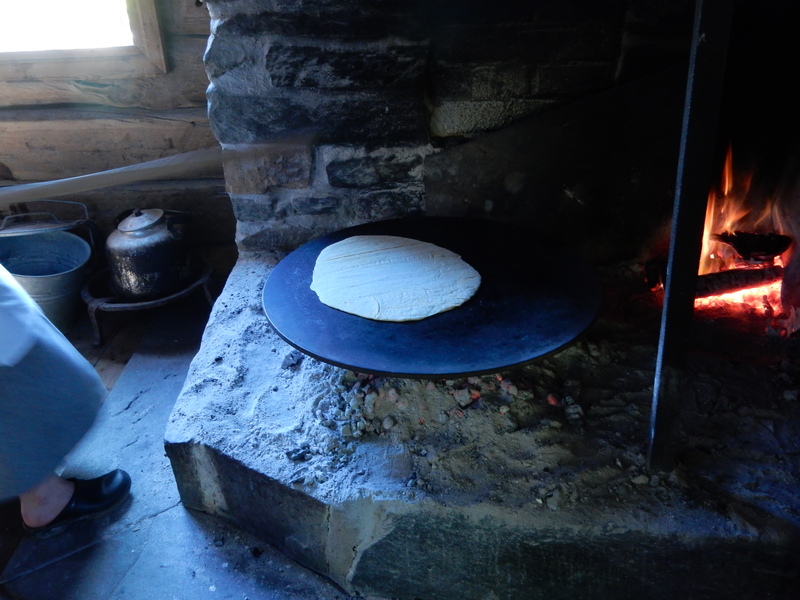 MAKING LEFSE AT A MUSEUM-FARM OF TRADITIONAL NORWEGIAN LIFE IN OSLO. From any perspective this trip was a fascinating geographic study in the familiar and unfamiliar. From the wild wooded mountains of Norway to the wild wooded mountains of China. I say wild because they are grand and picturesque even if, on the route I took, not quite of Himalayan stature. In any case the topography would be familiar to Rocky or Appalachian Mountain dwellers. In between there was the farmland of Sweden and Latvia and Belarus and the forest and farms of Russia. And, in a way, the most striking landscape of all—Mongolia and its steppes. The two ferry journeys, crossing first the Baltic Sea, later the Yellow Sea, confirmed that out in the middle of the water a sea is a sea is a sea, watery grave for the losers of bloody battles and transportation hub for the merchants that followed, but not so engaging moment by moment. What struck me most is that however similar the geography, the built environment begs to differ, to counteract your impression of majestic—see the bright friendly abodes of Norway; the sturdy isolated cottages of the Russian countryside, the magical gers of Mongolia. HERE’S EDVARD MUNCH WITH “SPRING LANDSCAPE AT THE RED HOUSE” TO START THE JOURNEY IN NORWAY. The Norwegian countryside allows well-mannered farms to adorn forest clearings with regularity. The peak-roofed houses of maroon, gold, chocolate-brown, spruce-green, charcoal-gray, snow-white and even black seem to reflect a culture that likes things strong and straightforward, at ease in a sometimes harsh environment but, at the same time, making their presence known. Red barns brighten the farmstead; contented cows and sheep and horses bask in late summer sun, fattening in the fields, preparing for the cold to come, everything is tidy against a background of bright blues greens sky lake fiord trees fields. Scandinavian landscape and color are interchangeable, even true in the winter; think of those bright buildings set against the white dazzle of ice and snow. 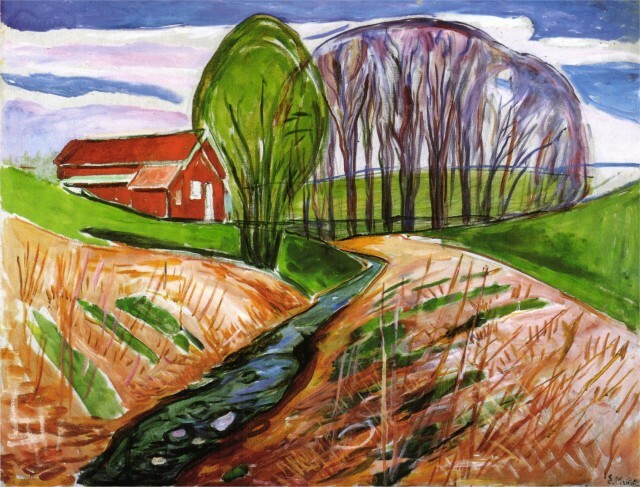 Munch’s landscapes are so true to this bold Nordic color scheme. The Russian countryside was endlessly fascinating to me. I’m sure part of the fascination of those small towns and villages tucked into the miles of forest or woodsy fields is based in the tales of hardy but always dancing Russian peasants all rosy with borscht and vodka. How to describe…small houses, cabins, wooden, log mostly in many places, dark brown with lots of Russian blue in roofs and doors. Surrounded by sheds of various sizes and shapes and colors and conditions. Never without end-of-season gardens, thick and green until the frosts arrive. There is always stuff about but it doesn’t feel like trash, just like the tools and implements of daily life—rakes, hoes, wheelbarrows, cans, an old box; there’s the dog, cow’s tied back of the red shed, chewing steadily on the tough old grass of September. Russian villages appear more cluttered and communal than their Norwegian counterparts with so many things in the yard and such dense gardens occupying every square inch of immediate tillable land; even more cozy in that way that moderate messiness has of implying life richly lived. And then the steppes and the gers and cottages and herds of Mongolia. Every time I drive the Great Plains of our west and Midwest and pass the lone ranch here and there I imagine what it must be like to live so exposed and alone. But my imagination simply stalls when contemplating life in a Mongolian ger (yurt) in the middle of nowhere…really, no-where, or rather a far-where. Steppes are ‘vast grasslands,’ bigger than our Great Plains perhaps. Gers, the primary habitat of the nomad class, look like and are at heart just big beautiful tents. They’re all white; made of felt and cloth and maybe canvas pulled over a very portable frame. The doors and the interiors are colorfully decorated but going by on the train what you see are these ghost-tents all alone in gigantic-sky country. A home place will frequently have a small cottage nearby or at the very least an outhouse and a shed or two, there will certainly be a truck outside, usually a dog or three of the shepherd, border collie variety, and some stuff, again—not junk, accoutrements of living. There will sometimes be a herd of horses and you may see the poles and lines and corrals for their training. Because I like to drive our plains and prairies so much I could imagine the pleasure of a few weeks of Mongolian road tripping, staying at tourist ger camps where I would be excused from drinking Mongolian tea but invited to gorge on the morning’s warm spongy breakfast breads and buns. Chinese roadsides. 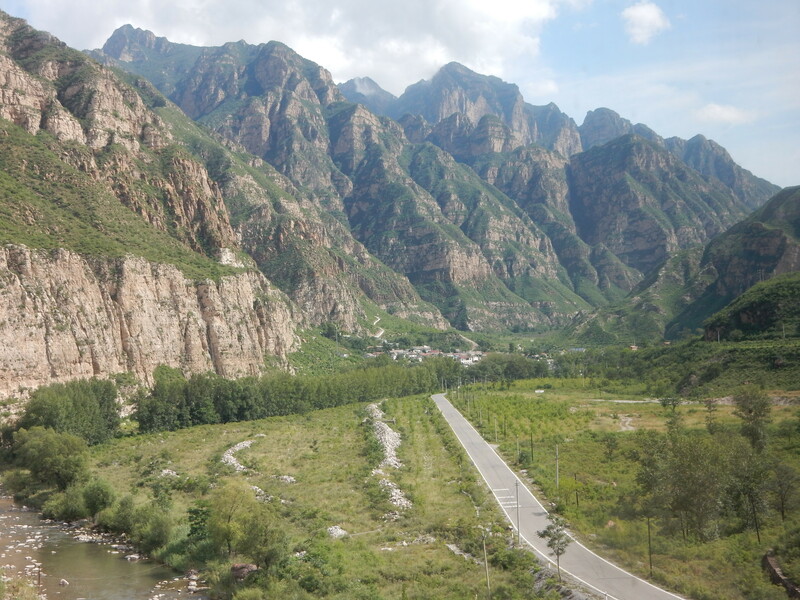 Well by the time it was morning on the train from Ulan Bator we were in the mountains that approach—for a very long time—Beijing. Villages were few and far between although stone dwellings popped up here and there. My compartment mate and I were too excited by approaching the last or, almost last in my case, destinations of our separate journeys to pay much attention to details when the mountains were so imposing and the tunnels so frequent and mysterious Beijing/Peking so near. It’s all so very interesting Marge. You must have the blood of Odin flowing through you. Thanks for giving the chance to accompany your authentic travels. Marj, congratulations! 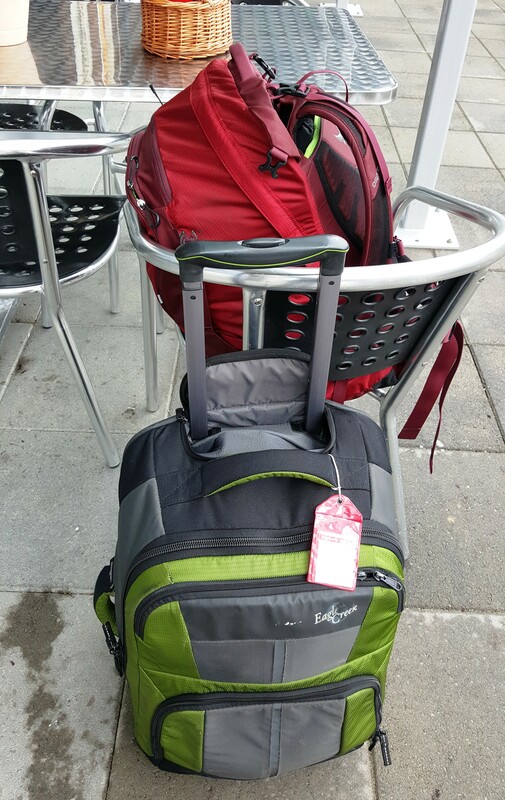 I don’t think I had ever traveled so widely and for sure never around the world in one trip even when I was working as a flight attendant with Air France some 35 years ago or so…..And barely over 16,000 miles when I fly RT from New York to Seoul in a week to participate at PAMS 2015!